Global warming due to increasing greenhouse gas Greenhouse gases (GHG) refer to carbon dioxide, nitrous oxide, methane, ozone and chloro—fluorocarbons occurring naturally and resulting from human (production and consumption) activities, and contributing to the greenhouse effect (global warming). (GHG) concentrations in the atmosphere has become a major concern worldwide. Climate change is manifest in higher average global temperatures, rising global mean sea levels, melting ice caps and an increased intensity and frequency of extreme weather events. Most scientific research suggests that the social and economic consequences of unabated climate change could be dramatic. At the same time, a growing population will put additional strain on non-renewable and agricultural resources. 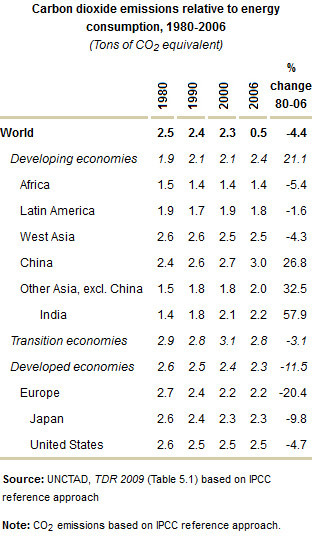 Rising demand for food, water, and modern energy will put pressure on scarce natural resources. This is likely to further increase the prices of food and energy, with particularly dire effects on poor people located in sub-Saharan Africa and South Asian importing countries, whose Governments often lack the policy space to guarantee affordable prices when global prices increase. Provision of food, water, and energy becomes more difficult when natural resources are not properly managed or when external conditions deteriorate as a result of global environmental changes. For example, climate change modifies rainfall and temperature patterns. This increases the likelihood of short-term crop failures, and long-term production declines with the deterioration in water quality. The most vulnerable are poor and food-insecure countries at lower latitudes, especially in seasonally dry and tropical regions, that largely depend on rain fed farming, again in sub-Saharan Africa and South Asia. Most of these pressures are moving slowly, but they cannot be stopped easily because of major inertia, including the pressures of fertility transition and GHG accumulation. Moreover, they will become fully apparent only in the long term, after 2015 or even after 2030, trapping people in their poverty and reversing progress. In that sense, global warming might become an important restriction to the efforts to achieve the MDGs. Note: Agriculture excludes land use changes. 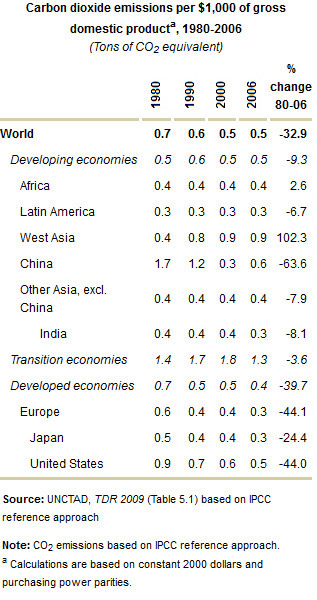 (Per capita and per $1,000 of gross domestic product) Source: UNCTAD, TDR 2009 (Table 5.1) based on IPCC reference approach Note: For per $1,000 of GDP, calculations are based on constant 2000 dollars and purchasing power parities. CO2 emissions based on IPCC reference approach.. 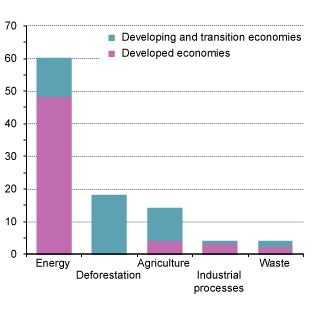 Developed countries account for most of the historical GHG emissions, especially the energy-related ones since 1900, and they are therefore largely responsible for the global warming. 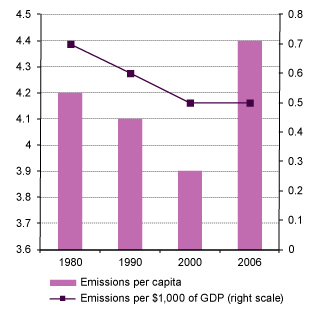 They also have much higher current per capita emissions than developing countries. However, most of the growth in total GHG emissions over the past four decades has taken place outside developed countries. Note: CO2 emissions based on IPCC reference approach. In addition to changes in the incentive structure through market mechanisms, direct government intervention by introducing emission performance standards and strict regulations that prescribe specific modes of GHG abatement appears to be indispensable for achieving ambitious targets within the envisaged time horizon. Climate change mitigation is an imperative that also requires faster creation and application of new technology. Carbon prices may provide a stimulus for accelerating the creation and application of appropriate cutting-edge technologies for carbon reduction compared with past decades, but significant public investment might be needed. Certain groups have called for a green New Deal to provide funds for the development of new technologies. In that sense, the austerity policies that have been pursued as a result of the recent international financial crisis pose not only a danger from a short-term, employment-generation angle, but also from a long-term perspective that aims at environmentally friendly development strategies. A green New Deal to provide funds for the development of new technologies is necessary, and austerity policies may have a negative impact on green investment.